CP II Alumni - Charged Particles: Jazz with a Spark! Andy Woodson is one of the most in-demand bassists in the central Ohio area music scene. Andy began playing bass guitar at the age of 12, and later studied double bass at the Ohio State University, where he recieved his BM in Jazz Studies in 1989. Since then, Andy has performed and recorded with many local and nationally known musicians, including pianist DD Jackson, David Murry, Billy Hart, Jack Wilkins, Kim Pensyl, Bobby Floyd, Mark Flugge, Vince Andrews, Woody Herman Orchestra, and Pete Mills. 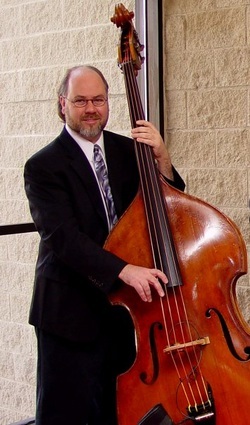 In addition to his performance schedule, Andy is currently the Jazz Bass instructor at the Ohio State University. As well as his work as a sideman, He also has three CD releases available, "Scioto","Catalpa",and "Magically Delicious".